At first glance you could mistakenly think this Orange Chiffon Cake is an Angel Food Cake. Both cakes are beautiful with their tall circular shape and that characteristic hole in the center which comes from baking the cake in a tube pan. 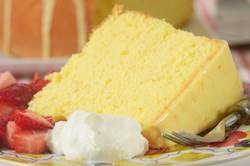 An Orange Chiffon Cake also has that wonderful light and spongy texture. However, they are also different in that chiffon cakes contain both egg yolks and egg whites, along with baking powder, orange juice, and a liquid fat (in the form of oil). It is the oil that gives this cake its wonderful moist and tender crumb and keeps the cake soft even when refrigerated. I like to dust the top of the cake with powdered sugar and it is lovely when served with fresh fruit (or fruit sauces) and softly whipped cream. I found this recipe while browsing through my mother's old cookbooks (The Woman's Association of St. Paul's United Church's (Spryfield, Nova Scotia) "Book One Favorite Recipes" dated 1956). The chiffon cake was invented in the 1920s by a Californian named Henry Baker who sold his recipe to General Mills in the 1940s. Chiffon cakes were very popular in the 1950s and then seemed to fade away. Luckily, they are now being rediscovered, maybe because they are hailed as having less cholesterol than other cakes or maybe it is because, while similar to an angel food cake, they are not as sweet. As I mentioned above, the batter is baked in an ungreased tube pan which allows the batter to cling to the sides of the pan as it bakes. The tube in the center of the pan lets the hot air circulate so the heat can reach the center of the cake. The cake needs to be turned upside down immediately upon removing it from the oven as this keeps the cake from shrinking and losing its volume. A few notes on ingredients. The eggs need to be separated and at room temperature, so about 30 minutes before making the batter, separate the eggs. Place the egg yolks in one bowl and the egg whites, along with one additional white, in another. Cover both with plastic wrap and bring to room temperature. The egg whites need to be at room temperature so they will reach their full volume when beaten. Adding a little cream of tartar helps with us, although you can leave it out. (Cream of tartar is tartaric acid and is a fine white crystalline acid salt.) Cake flour is made from a soft wheat flour and gives this cake it's tender and delicate texture. If you cannot find it you can make your own. So 2 1/4 cups sifted cake flour (225 grams) can be substituted with 1 1/2 cups plus 3 tablespoons (180 grams) sifted all-purpose (plain) flour plus 5 tablespoons (45 grams) cornstarch (corn flour). The recipe also calls for superfine white sugar (or caster sugar) as it dissolves easily into the batter. You can make your own by processing 1 1/2 cups (300 grams) of granulated white sugar in your food processor for about 30-60 seconds or until finely ground. You can use any flavorless oil; vegetable, canola, safflower, corn or even a sunflower oil. The one disadvantage of oil is that it does not have a lot of flavor, so chiffon cakes must get their flavor from other ingredients, in this case from both grated orange zest and freshly squeezed orange juice. You can use any variety of orange. I often use Navel Oranges as they are widely available year round. This sweet tasting orange is quite large in size, and has a thick pebbly skin that is fairly easy to peel and contains no seeds. As a side note, its name comes from the fact that the fruit has a navel like protuberance at one end which contains a 'baby' fruit. It is sometimes nicknamed the 'belly button orange'. Make sure to wash your oranges thoroughly before grating and remove only the orange outer rind (skin), not the white pith underneath, as it is quite bitter. Once you squeeze the oranges, pour the juice through a fine mesh strainer to remove any seeds or pulp. Orange Chiffon Cake: Separate the eggs while they are still cold. Place the egg yolks in one bowl and the whites (along with the extra egg white) in another. Cover with plastic wrap and bring to room temperature (about 30 minutes). Preheat the oven to 325 degrees F (170 degrees C) and have ready a 10 inch (25 cm) two piece ungreased tube pan. In the bowl of your electric mixer, fitted with the paddle attachment, (or use a hand mixer) place the flour, sugar (minus 1/4 cup (50 grams)), baking powder, salt, and orange zest. Beat until combined. Make a well in the center of the flour mixture and add the egg yolks, oil, orange juice, and vanilla extract. Beat until smooth (about one minute). Scrape down the sides of the bowl as needed. In a separate bowl, with the whisk attachment, beat the egg whites until foamy. Add the cream of tartar and continue to beat until soft peaks form. Gradually beat in the remaining 1/4 cup (50 grams) of sugar and beat until stiff peaks form. With a large rubber spatula or wire whisk, gently fold the egg whites (in three additions) into the batter just until blended (being careful not to deflate the batter). Pour the batter into the ungreased tube pan and bake for about 55 to 60 minutes, or until a wooden skewer inserted into the center of the cake comes out clean. (When lightly pressed, the cake will spring back). Immediately upon removing the cake from the oven invert (turn upside down) the pan and place on a bottle or flat surface so it is suspended over the counter. Let the cake cool completely before removing from pan (about 1 - 1 1/2 hours). To remove the cake from the pan, run a long metal spatula around the inside of the tube pan and center core. Invert onto a greased wire rack. Dust the top with confectioners sugar (powdered or icing). Serve with softly whipped cream (or ice cream) and fresh fruit. Store in an airtight container for a few days at room temperature or for about a week in the refrigerator. This cake can also be frozen for a couple of months. Note: To make superfine sugar, process 1 1/2 cups (300 grams) of granulated white sugar in your food processor for about 30-60 seconds or until finely ground.